It is very unlikely that you will be able to pick up BOOK and read through it cover to cover. This is why BOOK has been specially designed. Each story is very short and completely separate from the others, making it possible for a total stranger to pick it up, flip somewhere to the middle, read a bit, then leave, without having the feeling that they’re missing something. Because of this feature, BOOK is an excellent book to have in an office waiting room. Any age group can be interested by it, and it’s topics are more general than any magazine ever would be. The material is also not dated. It won’t lose its impact in two months. BOOK is perfect as a bathroom journal. Please feel free to read BOOK in any manner you wish. Read it front to back, back to front, or start in the middle and read both ways. In fact, you don’t even have to read it if you don’t want to. You can throw it out and buy another copy. But, whatever you do with it; Enjoy it. Editors note: In the year when this book was written, NO NAME GENERIC PRODUCTS were a new concept. I’m not sure which supermarket chain invented it first, and I have no idea how wide-spread the concept got, but stores actually started selling products in plain white or yellow wrappings with no style at all, claiming that dull packaging was a great way to bring the costs down. The fad quickly died, and although most large food chains still have house-brands, they are no longer sold in plain yellow wrappings. 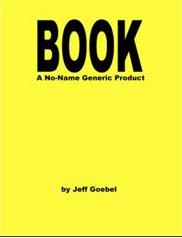 To summarize; the idea of a no-name generic BOOK was actually relevant and topical at one time… not just silly, for silly’s sake. Both versions of BOOK are identical, and also include my totally royalty free public domain sketch comedy scripts.